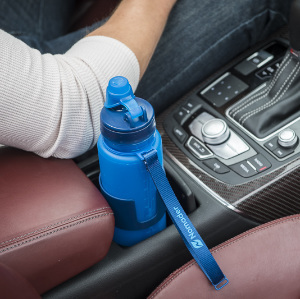 The Nomader® Collapsible Water Bottle is a top-selling water bottle and travel product on Amazon.com, and is consistently ranked as best-in-class by leading publications. 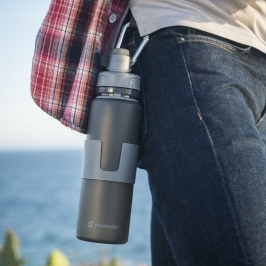 Designed for travelers and adventurers, the Nomader bottle is comfortable to handle and drink from, yet unlike glass, stainless steel, and plastic bottles, it can be compressed and folded up for compact travel. Seeking product donations for your next event? We love supporting charitable causes related to health, hydration, and travel. Your organization must be a registered 501(c)3 non-profit. Your event must relate to health, hydration or travel. We must receive your application 4+ weeks prior to your event. Thank you for the opportunity to support your cause. If your application is accepted, we will get in touch with you in 1-2 weeks. Please note that your application does not guarantee acceptance. All accepted applications will be responded to within 1-2 weeks.